Donning new projector headlamps, LED taillamps and fresh alloy wheel designs, the 2014 Hyundai Tucson enters into the new year with a refreshed appearance. The exterior enhancements certainly give the SUV extra flair, but they're not all this latest edition has to offer. Technology components, such as Blue Link, Hyundai Assurance Connected Care and navigation, have each been upgraded on the Tucson, along with a 4.3-inch color touchscreen audio display with a rearview camera on Limited and SE models. Two new high-powered GDI engines have also joined the lineup for 2014, improving the Tucson's driving dynamics and providing sufficient fuel economy. To find out additional information about the 2014 Hyundai Tucson in Arlington, check out our brief summary below, then scroll down for more details on its amenities and specs. Hyundai's signature telematics system, Hyundai Assurance Connected Care has been refined for the new model year. The highly-advanced program works in line with Blue Link to provide one-of-a-kind services to Tucson owners, which include monthly vehicle reports, roadside assistance, automatic collision notification and automatic diagnostic trouble code notification. In addition to this system, Tucson Limited models receive a revised seven-inch touchscreen display equipped with navigation. Improvements include enhanced voice recognition, navigation displays and system response. A 4.3-inch touchscreen audio system with a rearview camera, on Limited and SE, has also been enhanced and is available with a premium audio system/navigation. Two of the biggest highlights on the 2014 Hyundai Sonata are its brand-new GDI powertrains. The 2.0L Nu GDI engine is the first of its kind in Hyundai's lineup ?" 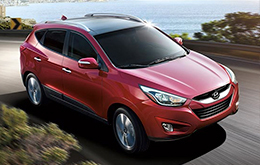 noted in several 2014 Hyundai Tucson reviews. Featured exclusively on the Tucson GLS, the powertrain outputs 164 horsepower and 151 lb.-ft. of torque, and produces higher torque at low rpms. The base GLS model also offers the powertrain with an AWD configuration ?" a first for the Tucson. Providing additional power is the SUV's new 2.4L Theta II GDI engine. It can achieve 182 horsepower and 177 lb.-ft. of torque, along with incredible fuel efficiency Arlington buyers will appreciate. 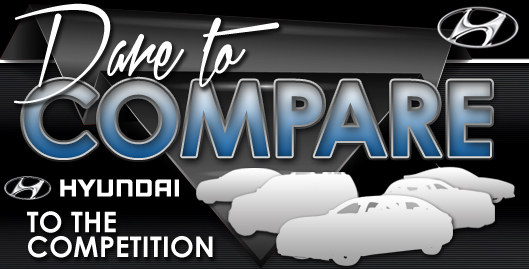 Compare the 2014 Hyundai Tucson to vehicles like the 2014 Honda CR-V, Toyota RAV4 and the Nissan Rogue, and we're sure you'll learn that the Tucson surpasses the competition in many areas. 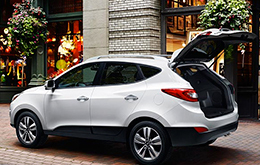 With cutting-edge cabin features and an tasteful design, shoppers will love the Tucson. It's a fabulous value. Just compare its price to the aforestated list of vehicles and you'll certainly see why so many Arlington drivers love it. For more details about what it offers, check out the Tucson's quick-facts list under this text. 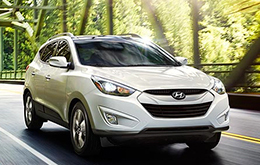 Make the search for your next car easier with Vandergriff Hyundai's reviews, like the 2014 Tucson overview above, as well as other Hyundai reviews in our gallery. Because it's uncommon to get reviews with up-to-date? specs on dealer sites, we've made it our obligation to provide reviews from expert writers. Every passage comes packed with practical facts, specs and research - just what you need to make good decisions about your next Hyundai purchase. Not sure if the Tucson? is appropriate for you? Check out our online research library to read more Hyundai reviews and to compare Vandergriff Hyundai's models to vehicles from other carmakers.